Second row George Kruis says England are ready for any maverick tactics from Italy in Saturday's Six Nations match. Two years ago, Italy's controversial, but at the time legal, 'no-ruck' tactic initially outfoxed England. The visitors took a 10-5 half-time lead at Twickenham but England ultimately secured a 36-15 victory. "We know they could chuck anything at us - like they have done previously. We're prepared for that and we're not underestimating them," said Kruis. England coach Eddie Jones was irritated by Italy's unconventional approach in 2017, complaining that "it wasn't rugby" and comparing it to Trevor Chappell's infamous under-arm delivery to prevent New Zealand hitting the six required for victory in a cricket one-day international against Australia in 1981. 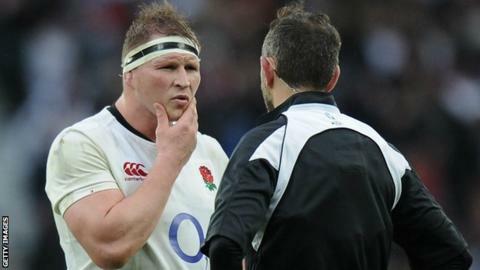 Italy had exploited a loophole in the game's laws that meant an offside line was only established when players from both teams contested the ball after a tackle. By opting not to commit any players to the breakdown, Italy were able to rush up into 'offside' positions in defence. As they did following Chappell's under-arm delivery, the laws have been changed to prevent a repeat. Kruis followed Jones' lead in suggesting that Italy head coach Conor O'Shea would be better advised to allow his team to focus on attacking rugby rather than spoiling tactics this time around. "If Conor lets them play then they can play and produce some magic out the back," he added. "They've put on some pretty good performances in this Six Nations. They're unpredictable and can play in different styles." Kruis is in the second row alongside Joe Launchbury after the former's Saracens team-mate Maro Itoje was ruled out with a knee injury. England are seeking to bounce back from their defeat by Wales last month, knowing that victory over Italy would maintain their Six Nations title hopes heading into the final round of matches. O'Shea oversaw the development of England prop Kyle Sinckler in his previous post of Harlequins director of rugby and believes the 25-year-old, who has played 20 times for England and made three Test appearances off the bench for the British and Irish Lions, will go on to be one of his country's great players. "England are bloody lucky to have him and he's going to become a pretty big legend in this game," said O'Shea. "He has a swagger but he backs it up with the way he plays. "Has he got an edge? Yes. But he's more under control than people think. When you are as explosive as he is, he won't take a backward step." During his time at Quins O'Shea highlighted Sinckler's potential to Jones while the prop was still only a fringe player at club level. "Eddie came to Quins in the first week he was in the job and asked 'is there anyone we are missing?' I said, 'Sink'," said O'Shea. "He is explosive, he has got the lot. For all the players we had at Quins - Chris Robshaw, Mike Brown etc - I said 'Eddie, the man is Sink'. "The kid is special. At the age of 16 we put him on the bench to go to Toulouse in the Champions Cup." Jones has brought together heavy-duty ball-carriers Manu Tuilagi and Ben Te'o in midfield, with the powerful Joe Cokanasiga on the wing as he bids to extended England's 100% record against Italy to a 25th meeting. The trio weigh in at a combined 53 stone and O'Shea believes his Italy side are the testing ground for a direct, physical style that Jones has wanted to experiment with for a while. "He won't say it, but certainly in the backline it is the one that he is dreaming of," added O'Shea. "We are looking forward to the challenge that brings. We will be put under huge duress by an absolutely enormous English team. "They'll be full metal jacket and we're ready." Former England scrum-half Matt Dawson speaking on BBC Radio 5 live: "Italy know what is coming. They will be doing a lot of preparation with forwards running as backs to get ready. "It is very difficult to replicate the footwork of Teo and Tuilagi but you can work on a system of defence that could break down big guys. "The lack of a second playmaker is a disadvantage for England though, not just to distribute wider, but to give nine another option at first receiver." Former Wales back row Martyn Williams: "They might blow Italy away but I don't think you can beat a New Zealand with that backline - you can't outmuscle New Zealand."